Sometimes, I get distracted by what other people think of me. No, let's be honest. Usually, I'm getting distracted by what I think other people might think of me. Most of the time, people don't actually say these things. They just say something that makes me think they might be thinking it. Here's an example: Often, when I'm out with Big Brother A, people will approach us and ask how old he is. We go through the silly "How old are you, A? Can you tell them?" and then me interpreting his answer because they don't speak 2-year-old. And then, frequently, the follow-up question is "Are you having more?" "Your child must be super spoiled, because he is already almost 3, and he is an only child, and he is getting a lot of one-on-one time, and he is getting carried. You need more kids or you will ruin that one." Really, why worry? 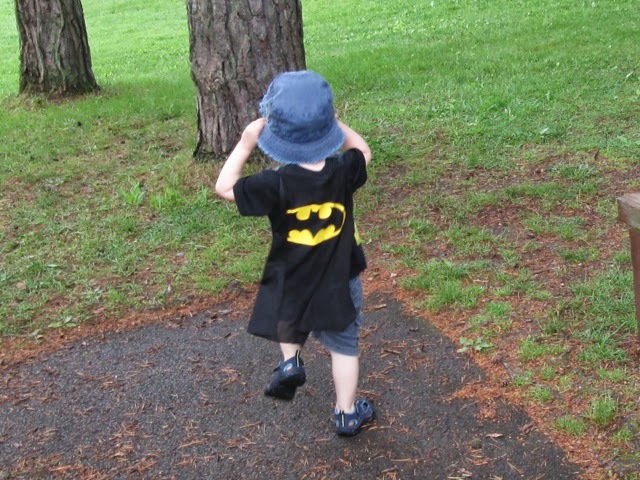 I mean, my son is Batman. Am I reading into things too much? Most likely. I do that. But do you ever feel that way? I have such a tendency to read into simple comments. I know why my husband and I have made the choices we have made. We've gone some directions that weren't very popular with the "general public opinion" over the years - like, for example, our decision to get married young without taking the time to "have a career first" or "test it out by living together". We have made these major decisions prayerfully and intentionally. We stand by them. So why do these comments rock me? Ultimately, the problem doesn't lie with the well-meaning stranger. The problem lies in my own heart. I'm a doubter. I'm a people-pleaser. I want to know that not only did I make the right decision, but that every other person I ever meet knows and believes that I'm making the right choice. I crave outward affirmation of my decisions. That's a problem. I'm looking to others for the satisfaction and peace that can only come from God. The more I focus on what others think of me, the more I chase my own thoughts around and around until I find myself standing far from the mindset I am called to have as a daughter of the one loving and holy God. There is no quick and easy solution to this problem. It's something I've been working on for years. I will always have a tendency toward people-pleasing and searching for approval from others. As I've learned to more faithfully surrender my actions and other people's opinions of them to God, he has been faithful to teach me ways to combat this sinful tendency in my life. Recently, I have been trying to get a clearer grasp on who God is. I've learned that you can't successfully banish a bad habit from your life without replacing it with something positive. Instead of ruminating on those things that other people say or imply, I'm trying to ruminate on my awesome God, who is excellent and worthy of praise.